You can now hire out the Fencing Solutions Post Hole Borer. If you are Evesham or Midlands based then you can book our Borer with an Operator by the Hour or Day. The below video shows the borer in action on one of our recent jobs taken using a regular phone camera. Why Hire A Post Hole Borer in Evesham? 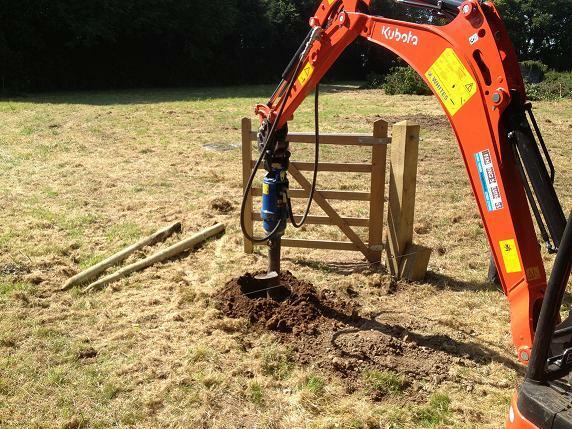 Our Post Hole Borer / Auger is a precision attachment which makes fence post erection quick and simple. A borer truly comes into it’s own when installing fencing on uneven ground or slopes. Versatile and extremely quick when compared to using a manual auger, the post hole borer comes with a post rammer attachment which can be used in conjunction with the borer or in the case of lighter fencing jobs, instead of. Our Borer and Rammer Operator is a skilled technician and will soon advise you on which solution is best for your job! To hire our “Man With A Post Hole Borer”, simply contact us by filling out the quick enquiry form, or call us on: 01905 748856 or 07808 273405 and we’ll be happy to discuss our rates with you.